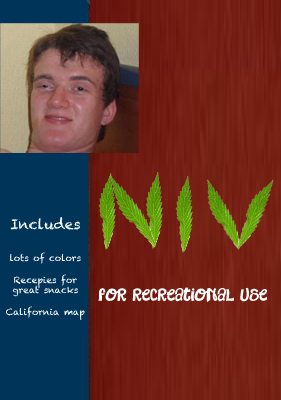 Churches all along the West Coast and the Pacific Northwest are at odds over a new NIV study bible that is suspiciously named "for recreational use." The Bible features the letters "NIV" on the cover made of some kind of leaf along with a peculiar picture of a very relaxed man. The study notes include an odd mix of seemingly random items and bits of information including over a hundred blank brightly colored pages, unusual recipes such as one entitled No-Bake Cheese Puff Casserole. Also included is a map of the state of California. And every copy comes with a chance to win a free trip to Amsterdam. "Something just seems fishy about this particular Bible," said pastor Timothy Evans of Cougar Creek Bible Church in Cougar, Washington. "I can't seem to put my finger on it exactly, but there's just something not right." While some are suspicious, others are openly accepting the new Bible. "We think it's fantastic!" said Todd Nelson, pastor of The Open Door Come As You Are Relevant House of Healing Fellowship in Portland, Oregon. "This Bible will touch people in special ways. We see people reading this that would probably never read the Bible otherwise. We really want to see more and more people having the opportunity to get spiritual highs." I heard that one church in Colorado, the "Secret Garden Fellowship" was giving these away advertised as "a token of our garden for you." When interviewed about it, the pastor simply said, "That's just how we roll, man." I have one of these but it's used for medical purposes.